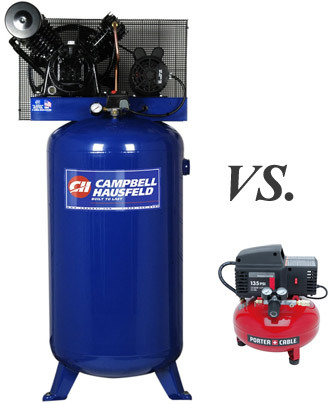 When it comes to choosing an air compressor based on performance, the whole thing is very simple since you only have a few aspects to consider. Most people make the mistake of buying an air compressor without thinking about size and the kind of work it will be used for. First of all, you need to determine how much compressed air you are going to need as well as the kind of tools you will be using. This is great, but how are you able to determine that? Luckily it all comes down to numbers. There are three factors you should be on the lookout for when sizing an air compressor: Size (obviously), power and the discharge pressure of the compressor. Size refers to the air tank mounted on the compressor, power refers to the horsepower of the motor, and the discharge pressure is the pressure of air delivered. All of these need a separate explanation, so let’s get to it! Compressor tanks come in many different sizes, orientations and configurations, so I would suggest (if you have time) to take a look at my article which explains all the different air compressor styles. Obviously, going after the largest available tank size (which is expressed in gallons) might seem like the logical solution. More air means you can get more work done without waiting for the tank to fill up, but there are some disadvantages to that approach. First of all, there is the issue of price. A bigger tank means bigger cash! There is also the issue of portability which can be a problem if you often move from one location to another. Sometimes you simply may not have enough floor space to house a large tank. Tank sizes range from 1 gallon to a whopping 80 gallons! So, how do you figure out which tank capacity is appropriate for which application? It’s simple. If you are doing the kind of work where you need to power air tools continuously, you are going to need a bigger tank. Once the tank runs empty, it will take some time for the air to fill up which is known as recovery time. If you have a large tank, the odds are it will never go empty in the first place if you’re only using tools intermittently. On the other hand, for continuous use there will be times when you just can’t wait. In which case, you need a large capacity tank that can handle constant use. Power tools like nail or brad guns only use short bursts of air, and drain the tank very slowly which allows the compressor to refill the tank in the meantime. This also means you can get a smaller size compressor. (When I say small, I’m talking about 2 to 6 gallons). Another thing you should consider is the power of the motor which is expressed in horsepower (HP). However, you should not get too hung up on this number because it isn’t always indicative of the true power of the compressor. A better indicator is the air delivery rate which is expressed in cubic feet per minute (CFM) as well as the discharge pressure which is expressed in pounds per square inch (PSI). But, before I get to that here is what you need to know about the compressor motor power. Horsepower ratings are often blown out of proportion. If the air compressor is hooked up to a standard power outlet, it will have less than 2hp because standard AC cords are only rated for 15 amps of current which works out at about 1,800 watts. A decent compressor should provide 4 CFM at 100 psi per one horsepower. The best indicator of air compressor power is the volume of air it’s capable of delivering at a certain pressure value. These two numbers are inversely proportional which means as one value goes up, the other one goes down. As I said a while back, the rate at which compressed air is delivered is measured in cubic feet per minute (CFM). Also, this number by itself does not mean much without the corresponding discharge pressure value (PSI). This number varies with atmospheric pressure, air temperature and relative humidity. For that purpose, some manufacturers give out a Standard Cubic Feet per Minute (SCFM) rating which is the normal CFM rating measured at sea level, 35% relative humidity and 68F. Each SCFM rating is given for a specific PSI value. More often than not, you will find the CFM rating is the product of the cylinder bore, stroke and the number of RPMs the motor operates at. It does not take into account the variables I have just pointed out. You will also find several CFM ratings for some compressors depending on the PSI. There you go! The three most important factors you need to take into account when deciding which size compressor to get. Don’t let those HP numbers fool, or impress you. Tank size is important if you are doing extensive work. CFM ratings are the true indicator of power, but only if a true SCFM is given out for a specific PSI number.